When The Perennial Plate held a lobster bake with Rising Tide Co-op, they had everything but dessert. Camerawoman, Mirra Fine, came to the rescue with this easy and fantastic pie made with frozen blueberries (but when in season, try fresh blueberries). 4 cups frozen blueberries (thawed and drained), when in season, use fresh! Cut very cold butter into tiny pieces and combine into flour. (I usually use my fingers to break down the butter into “pea sized” pieces). Add water a tablespoon at a time — mixing the ingredients with a fork or by hand until dough is combined but not sticky. (Note: pie crust dough doesn't need a lot of kneading, so as soon as the ingredients are combined, dough is ready). Form the dough into two balls, cover in plastic wrap and refrigerate for 30 minutes. Lightly flour a surface for rolling out the dough. Roll out one dough ball into a very thin circle and place into a 9" pie tin. Dough should overhang the edge of the pie tin by 1/2"; trim away any excess dough. Roll out the remaining dough ball and cut into 1/2-3/4" lattice strips. Combine berries in large bowl. Mix in flour and sugar and let stand for 20 minutes. Pour into pie tin. 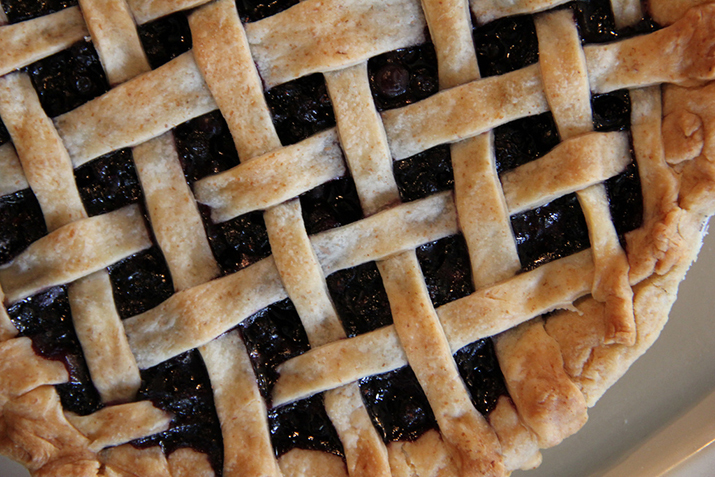 Lay on the lattice allowing strips to overhang the pie tin by 1/2"; trim away excess dough. Fold the bottom crust over the ends of the lattice and pinch to seal the dough together. Bake at 450°F for 10 minutes, reduce to 350°F and bake for 40 minutes or until golden brown.